• Make family meals regular: Knowing breakfast and dinner is being served at the respective time everyday can be comforting and appetite enhancing to the kid. Kids who eat breakfast tend to have good health and do better at school. • Cook more meals at home: Eating homemade food is healthier for the whole family and teaches kids the importance of food. Dine out occasionally. • Get kids involved: Children enjoy helping adults in their chores. Involve them in cooking, shopping for groceries or in preparing their lunch box. It gives them a chance to know and taste different foods. • Get creative with healthy snacks to avoid junk: Keep plenty of fruits, whole grain snacks, nuts and healthy beverages like milk, fresh fruit juices, milkshakes, etc. easily accessible to kids instead of junk foods like pies, chips, wafers and sodas. • Limit portion size: Do not give a too big or a too small portion size. Limit it to a standard size depending on his appetite and meal time. Never use food as a reward or as a punishment. 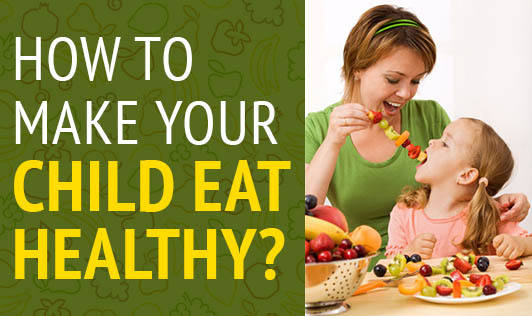 How to introduce a new healthy food to your kid? • Offer new food only when your child is hungry and relaxed. • Eat the new food along with your child, they love to imitate you. • Involve your child when you are cooking a new food. They would love to try the food that they were involved in cooking. • Limit snacks to two per day. • Limit beverages, if your child is a picky eater. They tend to fill up on liquids. Make food and meal time an occasion your child looks forward to!